Tis the season for singing Christmas carolers and sweet-sounding symphonies! 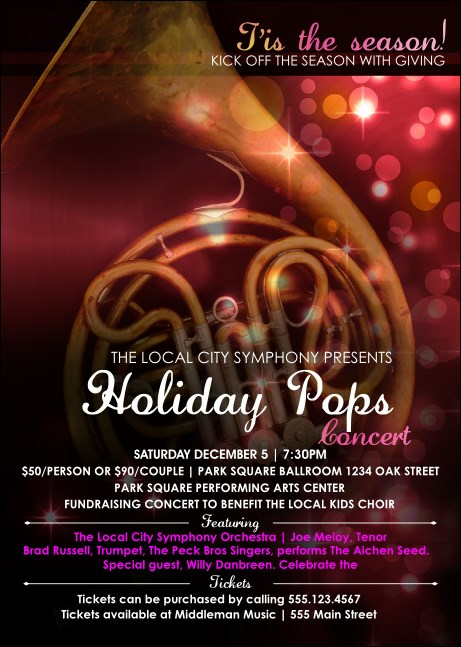 Personalize your pre-event promotions for your seasonal music performance when you send out Symphony Holiday Pops Postcards. These Postcards are pretty with red and gold lights glimmering in the background and a golden French horn at the center. Don’t pop your top over holiday event promotions! Advertise in advance with TicketPrinting.com.